1 mana cheaper and 1 less health than that Tar Lurker as a comparison. Since we are losing most of the good taunts, I'll definitely put this minion in my Control warlock. What Tar Creeper should have been. Great defensive minion for control and combo decks. = how Tar Creeper should have been designed. This way it's pretty useless for Aggro decks instead of becoming a "tech card" for mirror matches but very much playable for Control/Combo (and to a lesser extent, Mid Range). This is a very good taunt. And it will definitely fit in a variety of decks. People were asking - where are the taunts - well, here they are. Is this the first Lightforged Draenei card? Better than Lone Champion, slightly better than Tar Creeper. I can't speak for everyone, but what I meant was that this is a tar creeper that aggro can't make good use of. Creeper was arguably a better aggro card than it was control. This is a pretty good taunt minion for control decks who will typically not have any other surviving minions on turn 4; and if you do they're probably disposable. It's probably not as good as Tar Creeper though since most classes have pretty good alternative plays on 4 mana, with more of a hole on 3. Slower shamans have the biggest lack of good turn 4 plays I think, but the effect is awkward with his hero power. Far weaker than tar creeper, you get 1+1 in stats for 1 mana which is obviously a bad deal however Tar Creeper was to strong after all so this might be perfectly balanced. unlike the tar cards, this card requires you to develop no board to maintain its effect, which isnt good at all. Maybe in some stall decks its good (like mechathun decks if those somehow continue existing), but otherwise go with the safecracker or something like that. Its always a 6 HP taunt . 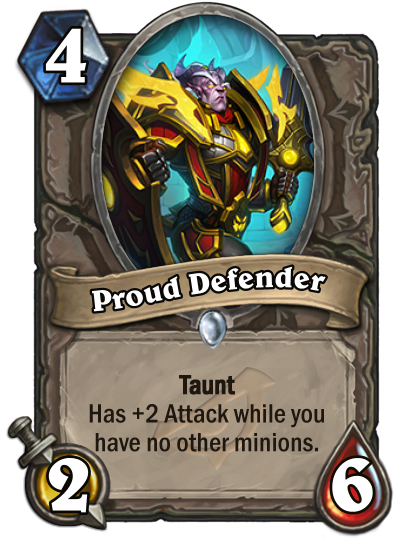 If you play against a super passive deck like old Priests, the minions you already developed might be putting enough pressure so those 2 less attack are ok i guess. This is actually pretty good for the decks it's intended for (slower decks, towards the slow end of value into control) - the condition isn't going to be hard to meet for those decks against more aggressive decks, and as such it's often going to be a 4/6 taunt for 4 when you're playing it as intended (which is almost 5 mana stats - given that people have been pretty happy to play cards like 4/7 taunt for 5, as well as things like 4/6 faerie shroud for 5). The best part is that if you do end up needing to play a second minion for whatever reason, 2/6 isn't even that woeful. It's not great, sure, but it's not like it's a Mogushan Warden or anything. Ideally you'd also have already gotten a hit out of the 4 attack before playing the second minion. This is great, even if you can't manage to take advantage of the text, it's still 6 health your opponent must remove. This card is really good in Ctrl Decks. Proud Defender in an Aggro metagame, Omega Defender is a Control metagame?